In our present day there is a wide variety of entertainment sources available. From television to feature length films twenty-first American citizens have come to greatly rely on using media for entertainment. Out of all of the choices for electronic media today the radio has been a consistent source of news, information and entertainment since its inception. 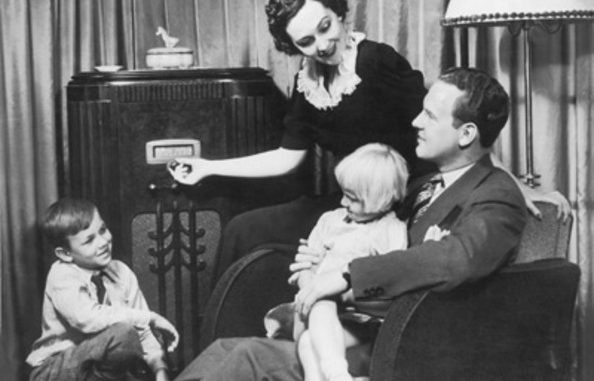 Before television and movies became popular the radio was the primary source of electronic entertainment for many families in the US. A time in history when the radio was very popular was entitled the Golden Age of radio. The Golden Age of Radio was as an old-time radio era when radio programming in the United States was the primary electronic entertainment medium in nearly every home. The Golden Age began in the 1920’s and lasted through the 1940’s, when the appeal of television –offering both sound and imagery– began to become more affordable and took the place of radio. People who experienced radio in the early to mid-twentieth century did not have easy access to archives of their favorite shows from childhood or young adulthood. But modern technology through the Internet, computers and online resources such as Youtube allow us to have access to countless media, in such a way that was not at all possible in the past. We now have access to thousands of classic radio broadcasts that offers an invaluable resource for middle school and high school teachers. Educators can use radio broadcasts to teach about certain time periods and ways of life during the early to mid-twentieth century. Teachers can help students have a more rich understanding of American history, civics and democracy via old radio archives. Using historical speeches to teach American history and historic political ideas.A big part of good social studies teaching is the use of effective and meaningful primary sources. Primary sources do not only consist of print resources. In fact, nearly all radio archives can be considered primary sources. Teachers can use speeches to understand certain historical events or key figures in history. For example, students can listen to audio of US presidents from the past such as Herbert Hoover, Franklin Delano Roosevelt or Harry Truman to help students understand the political climate of certain years or decades. The Internet offers many of the transcripts of these speeches that can allow students to do a text analysis of them for a closer read and understanding of the concepts. Using radio programs to teach students how people lived in certain time periods. Students can listen to radio shows of various genre’s such as westerns, mystery, suspense, thrillers, science fiction or comedy to create projects that give students a glimpse of what life was like in the early 1900’s. For example, students can listen to episodes of the western entitled Gunsmoke to supplement a unit on the American West and Native American culture. They can explore American perceptions of the west and how Native American’s were portrayed and how stereotypes persisted. Using radio programs to teach students how people viewed life in certain time periods. The 1950’s was often idealized and projected an American utopia and innocent way of life through radio and television. Wonderful discussions and lessons can be built from these radio sources. For example, teachers can use sitcom radio programs such as I Love Lucy, The Aldrich Family or The Ozzy and Harriet Show to supplement a unit about what everyday life might have been like during the 1940’s and 50’s, verses how it was portrayed on the radio. In this same way, science fiction radio programs such as Orson Welles’ The War of the Worlds can be used to explore American perceptions of science and outer space during the 1940’s. Using historic radio news programs as primary sources to teach American history. Radio news archives can offer a treasure trove to students studying the early to mid-twentieth century America. For example, when teaching a unit of World War II teachers can integrate the audio archives of the news report of the attack on Pearl Harbor to get a sense of how the attack affected the American public. Below I have offered a number of links to various radio broadcasts that can be used in the classroom. I have also provided sites that offer lessons on incorporating some aspect of radio in one’s teaching. CBS Radio Mystery Theater Brain Drain – Old Time Radio Mad Scientist Horror! Escape “Man from Tomorrow” – Old Time Radio Science Fiction! Hall Of Fantasy AUTOMATON – Old Time Radio Science Fiction Horror! Dimension X “Almost Human” – Old Time Radio Science Fiction! The golden age of radio was special, indeed. It’s always interesting speaking to the elderly who can remember family gathering around the radio to listen to their favorite programs because they remember it so fondly. Personally, I did not own a television through the nineties, and radio programs were an important part of my entertainment and news source as well. Yes, it is possible to live happily without a television! Currently, I often look forward to the radio program hosted by NPR called Storycorps which documents events in lives of people with a story to share. The thought of having just a radio versus in today’s world having another devices like T.V.’s, radios, computers, and etc. It sounded like it was an interesting historical event.I am a 90’s baby and growing up my family and I had only one T.V. that was located in the living room. Occasionally we would listen to the radio to get news updates and what have you. But normally we would turn on the T.V. to listen to the news. We only had select T.V. channels though. Looking into perspective though it is very possibly to live without a T.V. I have recently been into listening to many podcasts and they are actually very interesting. I am specifically responding to the Using Online Resources to Teach Effectively section. I feel like this is suuuper awesome. I am going to be an elementary teacher and most likely wouldn’t use this technique in my classroom but for older kids classrooms this is genius! In history classes that need to know about culture and lifestyle of an older time period would be able to use the radio to listen and learn. Brilliant. We are very lucky to have access to archives of radio broadcasts! With the help of online resources, we are able to step back into time and better understand what was happening during almost any time we wish. It is also very much a great tool for teachers to use to help educate students during an important time of history. Being able to hear live and now see live feed of what was happening during a certain event can help people understand the significance of why something is so important. As a millennial in today’s society, I do appreciate the fact that we have the ability to access millions of information at our fingertips. However, I feel that today’s society has grown too rely too much upon this and we are regressing as individuals. For example, many of us have communication issues and it enables us to put our thoughts into words and sentences when face to face with one another. During the “Golden Age,” I feel that they were a growing community of individuals excited for a new era. They did not take advantage of their surroundings and they celebrated one another’s successes more efficiently. The form of radios and broadcasts were there go-to means of means of news information. This helped one another become aware of weather, crimes that were taking place, and all other information that may have needed to be broadcasted. As teachers it is our duty to inform students on how life was before to either remind them of what the mistakes we made or two remember something significant. As a English Secondary Education major, I would to incorporate some of your ideas for lesson plans into my own. Like when discussing a certain author, I might retrieve a broadcast from that era that gives them a specific idea on how society was then and what they endured (reasons the author wrote the story). In addition to this, I would like to add that many individuals had seen the Television and noted that they did not think they T.V. would go very far. They had initially thought that the radio would be there only means of programming. I love the idea of using radio clips to teach social studies! It is so important for students to experience what the people of the time would have experienced as much as possible! I think that students would be more engaged in listening to a segment of a speech or radio broadcast rather than reading a transcript of the speech. Further, it would be interesting for students to think about the difference between the different mediums of communication. Interesting and important discussions could occur when you talk about the other underlying factors of giving a speech vs. writing an open memo vs. a television broadcast vs. an interview. As a future educator, I believe that by using old broadcasts, especially in social studies, to help supplement content material is a great way to put the students into the mindset of living in the time that the broadcast was aired. It’s a great way to engage the students and show them that not everyone has grown up with cell phones; it really puts their lives into perspective and helps them imagine a life without the technology they have! With our current technological advancements, it becomes easy to forget that we do not need to be consumed in it 24/7 and this way, we can remind our students of that same philosophy. I really liked how this article included the possibilities of using the golden age of connecting a time period that seemed so long ago to our present day situation and by doing this, it creates a bridge for the students between where we used to be and where we are now. I also appreciate how you added in lesson plan and radio program archives to future educators to one day utilize! I can remember as a child, listening to the nightly news with my Grandpa. We would sit quietly in the living room all gathered around the radio, but at the time, I wasn’t sure what I was waiting to hear. I know after listening, my grandparents and parents would discuss and sometimes debate, but I was really waiting to hear the “show” after the news. I can remember, even from 25+ years ago, waiting to hear what was going to happen next in the mystery story! When it comes to using radio in the classroom today, I think it is a fantastic idea. Nowadays, students can access anything online within seconds, they just ask Siri or Alex, get their answer and move on. But what about students having to wait and listen to find out what is going to happen next? The ideas listed for lessons are great, I feel that I could take it even a bit further, maybe set the room up like early 1950’s, have students listen, discuss, and create based on what we are listening too. Another great idea is for students to create their own radio show based during a certain time period, be a character from that time and tell us what is happening! I grew up in the 90s. I have always remembered having a tv. I was not brought up listening to the radio and broadcasts. However when I was in high school. I do remember listening to the speeches during history class. With the way that technology is now days, everything is available to us at our fingertips. Its so easy to ask google. I feel like back during the radio shows, family sat down and had quality time together. They were able to enjoy the broadcast vs. just using a tv as background noise while the family plays on their phones. It is hard for me and I think for others that are my age to even think of a world with no use of electronics. Since I was young, I can remember there being a television in a couple rooms of my house, and having my own Barbie radio in my room. It is amazing to see and think about how far technology really has came. It truly amazes me to think at one time, families would all sit around a radio to receive their news and entertainment for the day. Today it seems as if electronics are given to kids at younger and younger ages each year. Which in the end can be a good thing and a very bad thing. Having kids being tech savvy is a plus, yet can hurt their learning, communication skills, and etc. Although, I think using technology in class:podcasts, radio shows, documentaries, and or YouTube clips are always a plus when trying to grab your student’s attention and further their learning. I find it really interesting that the radio was used for entertainment back in the day. I remember watching an old TV show with my dad and the family on the show would gather around the radio at night to listen. I also had no idea that I could possibly use these radio clips in my future classroom! I love the examples of these lessons provided in this article! I will definitely look deeper into radio broadcasts and incorporate them into my classroom. The radio is much more than just music. The radio used to be the only source of entertainment and a way for people to be updated in events. Now we have television, internet, and phones as resources, and we use the radio to learn about the past that we couldn’t capture on video. Listening is just as important, if not more important, than watching something on TV. This is mainly because we’re still able to hear emotion when listening to these podcasts and radios, minus the added bonus of being able to see reactions. We’re able to focus on what the speakers are saying, and I think that’s important. Having access to archived radio is an amazing primary source to use in a classroom as it is a unique media to share important information about said period with students. Students when required to use primary sources typically resent them for their long winded language and long texts, however allowing student to access to educational and entertaining primary sources could revolutionize history classes, and how history is taught. I think it is important for students to listen to radio clips as a way of studying certain time periods in history. Listening to these radio clips can give an insight on how life was like in a certain time period. These radio clips also give another way for students to learn instead of always reading out of the textbook or being lectured by teachers. I think radio is important to reintroduce to these students nowadays because a lot of students may not be familiar with radio given the technological advance within the last couple of years. Media has been and continues to play an integral role in today’s world. With the growing popularity of podcasts, I feel that the golden age of radio is sort of coming back. People are listening to “talk shows” through podcasts. I’ll even listen to them in the car with friends or with my coworkers while we work. I really liked the idea of being able to use radio clips in the classroom. I could even do this by building schema with podcasts first. I like the idea of using radio clips to study people form specific time periods. In my classroom, i can have my students listen to a radio clip from, lets say the 70’s, to get a better understanding of how life was lived for the average person back then. As a class we can have a discussion, and draw comparisons from what we heard on the radio to what we would have been learning in the unit. We could draw political comparisons, social comparisons and probably many more that could all tie back to a unit of the text. I feel that radio clips from the past can, as cliche as it sounds, “breathe life” into the topic that students can learn. By giving them an opportunity to hear what people of that time thought or believed about the lesson it can give insight in how life was like for the era. What is especially amazing to me is how much of the archives are being digitized and saved for future generations to hear. I was excited when I read this article because I had never before considered the possibility of using old radio broadcasts and shows to teach history. Radio broadcasts (such as the radio announcement of the attack on Pearl Harbor) would be a great way to help students learn history. Instead of just reading about World War II in their history books, the students would be able to hear the announcement and have an idea of what it was like to hear it and realize the country was actually under attack. Using the radio broadcasts would thus make learning social studies more meaningful for students. I honestly think the radio does a better job at describing and telling how things are in a situation because people cannot see what is going on. My grandpa use to watch the baseball games by turning on the TV, turning the sound off, and then turn on the radio because they did a better job and broadcasting. I thought this article was a really interesting topic on how radio broadcasts can be used to teach history. Having the different clips from several time periods is a great resource to have today. Actually listening to what was happening instead of only reading about it allows you to feel more immersed in the event. I thought this was an interesting article. As a future educator, I think it is a good idea to use broadcasts from the time period we are learning about in social studies to help students get a sense of what it could have felt like hearing that broadcast for the first time. By using broadcasts, we can take our students to that time period and they could experience some of the emotions that one might have felt during that time period when they first heard the broadcast being played. It is an interesting way to show our students how they would hear/get important information during that time period, because at one point in time there were no cellphones to look at for daily news. Some people only had broadcast, newspapers, etc. so it is cool to be able to tie how people got information back then and compare it to how we receive information now. It is also a nice way to keep students engaged during a lesson. This article has an interesting view of the world today and back in the day of radios. After reading this article I am glad that I am going to be a teacher in this day and age. With our advance in technology, teachers are able to pull from the past easier than the radio days. I am also glad that this article comes with plenty of resources for teachers to better teach their history lessons. all together this article helped me look at the privileges I have not and make sure that I use all of them so that my students will learn the most about our history. As a kid, I would watch a soap opera with my grandmother called Guiding Light. It wasn’t until I was much older that I was told that the show actually started out as a radio series in 1937 and switched to television in 1952. The Golden Age of Radio was a pivotal part in American history as well as distribution of knowledge and information. This is an aspect that can easily be brought into the classroom. The use of radio broadcasts to instruct students provides a change in typical classroom lecture as well as first hand accounts of historical events. This is a concept that would make a great addition to my future classroom. I think that it is very interesting to use radio broadcasts to help teach history. It can give the students a better perspective of what they are learning and help them to connect to the history being taught. I hadn’t thought about it in the past, but in my future teaching I think that it would be very beneficial to include these broadcasts in my lessons. Usually when I would think about radio being used I would just think about the types of music and how that has changed, so reading about using speeches and reports that were used by people at the time also is very interesting. This article was really good. I have always seen people on old TV shows and movies how they sit around a giant radio and I think,”is that really what people did?” When I think about it though, I realize it is basically what we do with TVs in today’s age. We all sit around a TV using it for entertainment just like everyone did with radio back then. It’s an evolution of entertainment that is really fascinating. I think radio is a largely underused medium. Something I enjoy doing to listening to congressional, gubernatorial, and presidential debates some recent some older. It makes for interesting and engaging background noise when studying or working on art. Something that is really fun to do is put on headphones and listen to the old 1959 Rod Sterling Twilight Zones. I remember listening to them in the car with my grandpa when i was young and being blown aback and recommend it for everyone. I had never thought of radio broadcasts being used in the classroom to teach the history of a social studies topic. I like the idea that the students can step back in time and listen to the way people talked and the situations during the time period. I also find it useful that this is another resources of getting the content to students. As a teacher, I could stand up and lecture on a specific topic but that form of relaying information might not be as affective as the students listening to a historical broadcasting. This is another useful tool that I would like to implement in my own classroom. This article I believe will help me when I become future educator. I think because of the times we live in we often want to associate the news as either: leftist, central or rightist maybe worse we want to say its fake. I think it often becomes a struggle to understand that the news at its core represent a time period the issues faced, the triumphs, or maybe new medication that saved thousands of lives. While I still think you should take what’s going on in the news with a grain of salt, this article woke me to the realization that the news can be a way to introduce a topic or to gain empathy from a student. I think a good example of how powerful the news can be is if you watch the video from 9/11. It’s one thing, to say terrorist killed thousands, but to see it that’s devastating and becomes engraved in your mind. To be honest that is why I think students need to see and hear how people felt so they fully understand the event and its impact on others. I think the radio is a very underused as a medium in the education system and this article demonstrates that it can still be useful in the classroom. As a future educator hoping to teach on social studies content, these are some great ideas to bring to the lesson plans. I listen to the radio and podcasts everyday, whether it is for entertainment, learning, or just to relax and I think bringing the radio in to the classroom will be a great attribute. Not only can you use it as a learning tool, but I have experienced classrooms that have a certain mood set by the background music playing. I had an art teacher that would turn on theatrical music when doing sculptures and slow orchestral music when sketching. It kid of always set the pace and mood in the room. radio used to be the #1 way to recieve news,sport results and weather so it is strange that it is hardly used today. Bringing the radio into your classroom somehow can do a lot of positive things to the classroom. I think that radio is a great way to show an era. Different clips from past radio viewings can really showcase an era. Music in general affects peoples moods and I feel like podcasts and music from certain times can really help certain kids so the lesson about that era, sticks in their head. Not only will students be learning about the era, they’ll be hearing how people talked and how they sounded. I never thought about using radio to teach American history, but I think it’s a great resource to show students the attitudes of people in that time period and how they lived. Podcasts are such a popular thing in today’s society, so it makes sense to access radio shows from the past when teaching history. I think students would be very engaged in listening to radio shows because it is something different, rather than watching a film or reading a text. Using radio as a resource seems very authentic. I have checked out some of the radio programs you listed, and I’m so excited to use it in my own teaching! These are great resources for not just teachers, but for anyone that is interested in American history. I don’t often think of radio as having that much popularity because most people prefer to get their news from the TV, internet, and even a newspaper. I think that main draw towards these outlets are the visual aspects that come along with the auditory ones. But it is understandable that during the Golden Age of radio when these visual outlets were not available, that radio was such a big deal. One lesson that I think would be so fun for students would be for them to act as radio hosts from the Golden Age and they would create a radio show for the rest of their class and talk about a historical event as if it were happening then. I think this would be engaging and is a whole new way for students to learn about past historical events. I love listening to radio! My grandparents constantly talk about how the times before television. I enjoyed this article because it talked about the golden years of when the radio was in its prime. It seems strange to me how once people went to the radio for information since it was there only source. Now I reach for my phone to have instant access to information. I think incorporating primary sources when teaching social studies is very important but I had never considered using radio broadcasts before and I think that is a really great idea. By listening to the radio students will be able to have a better understanding of what it was like to live in a certain time period in history and it would be way more engaging to the students than reading a text book. There are many awesome lessons that could incorporate listing to radio broadcasts. As a future teacher, I think using radio broadcasts would be a great classroom tool. It not only is educating the students but it is giving them real life situations. Growing up we had so many tv’s in our home, along with cell phones and multiple computers. I could not imagine living with just one radio to get information from the outside world. Of course it is possible and simple, but I feel like in today’s society no one would know how to live without all of the electronics and technology we have in our homes. As a future educator in a middle school setting it is often hard to gain the attention of the students for long periods of time. Using primary sources such as radio recordings of historical events will allow the students to understand that the events they are learning about were real and they actually did happen. I think having my students listen to primary sources of audio tapes allows them to gain a certain interest in the topic as well. It is also important to look at the technology influence as the years have gone by, people use to listen to the nightly radio for entertainment and now people have TVs for entertainment. I have always found the golden age of radio very interesting and a unique time in our history. As a teacher, I think that there are so many activities that you could do with radio segments for example you could teach primary resources and specific events in history. You could also do an activity comparing time now vs time then. Prior to reading this article, I had never thought of using historical radio broadcasts in my classroom. Not only would this teaching tool allow students to get information from a unique primary source, but they would most likely be interested in the familiar media. While young students may not listen to the radio often anymore, it would be a great lesson to teach students the importance of the media throughout history. As explained in the article, I think using these radio broadcasts is also a great way to show students how people lived and viewed life in certain time periods.